Two readers love this post. 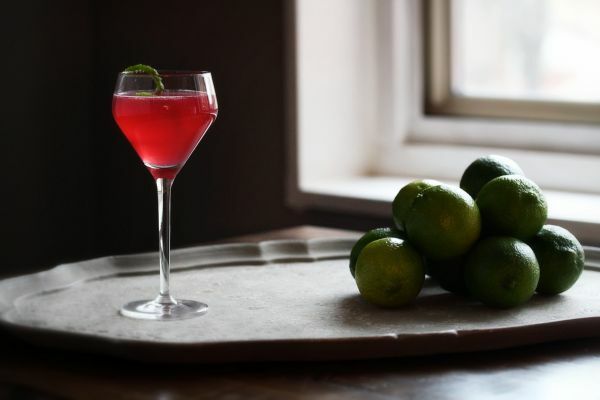 Add the NOLET’s, Cointreau, lime juice and cranberry syrup (see below) to a shaker base. Add ice and shake vigorously until the outside of the shaker begins to frost. Double strain into a chilled cocktail glass. Garnish with a lime twist. Take 2 cups of 100% pure cranberry juice (unsweetened, not from concentrate) and dump it in a pot on the stove. Turn the stove on and reduce the juice by 50%, until it’s about 1 cup. Remove from the heat, then add in 1 cup of sugar. Stir to dissolve. Let cool and then store in the fridge. Optional: add 1 tablespoon of vodka to preserve. Fresh citrus, rose and a light cranberry nose. The taste is just sweet enough but not cloyingly so with great tart flavor. The rose and botanicals of NOLET’s gin come through lightly in the background. This one is smooth and fresh throughout, including the finish. I recently had the opportunity to bartend an Oscars party for some really great DC ladies. While planning the menu for the evening, I received a “must have” drink request: a Cosmo. Now in case you couldn’t tell, I’m definitely not a fan of vodka and I certainly have never made a Cosmo. In fact of all the drinks on The Straight Up thus far, there is only one with vodka in it: The Vesper; and to be perfectly honest I’d take a classic Gin Martini over 007s drink any day. Rant aside, you can imagine how much I didn’t want to make that Cosmo. Step one: Figure out what the hell is actually in a Cosmopolitan. I had some idea, but wasn’t totally sure where to begin. After a bit of googling, I found most recipes used a combination of citrus flavored vodka, triple sec, lime juice and cranberry juice (or grenadine). One of the problems for me with most popular drinks is that they are often made with suboptimal ingredients. With a little tweaking this could work, which brings us to the next step. Step Two: Make better juices. Obviously, fresh lime juice would certainly beat any prepackaged stuff floating around out there, so that one’s easy. As for the cranberry juice/grenadine, I decided to make a cranberry syrup much like one would make grenadine. To do this, I reduced 100% cranberry juice (unsweetened, not from concentrate) and then added in equal parts sugar. Tastes awesome. Step Three: Ditch the vodka. I really did try to like this one with vodka…. no really, I swear. While it tasted ok and certainly would have passed for a better version than what you’d likely get most places, it just felt lacking in flavor. I tried it with London dry gin and it was good, but maybe a little too different for a vodka drinking crowd. As a last ditch effort, I tried it with NOLET’s gin as I’ve found it to be much more approachable to vodka drinkers than something more “gin-y,” almost like the gateway drug to gin. Sure enough this version tasted really good, as the citrus in NOLET’s hit the right citrus notes and the rose flavor really worked well with the cranberry syrup. This one really turned out well (I mean, it must of if I’m sharing it with you all). More importantly, I managed to make a Cosmo type drink that the guests loved simply by working in better ingredients. The ones I spoke with thought that it was “worlds better” than the Cosmos they’d had before, and most had no clue there wasn’t vodka in it. The downside? It ended up being liked so much that once people tried it, it became the only drink ordered until the ingredients were gone. Parties are fun. Looking for help designing a cocktail? Need a menu created? Hit me up, I can help. Fan of pre-prohibition style cocktails, bitters, amari, and good whiskey. Almost too pretty to drink...almost 1 Vote Up! Whisky Review – Bluebird Distilling Four Grain Bou... 2 Votes Up! A Broken Down Understanding of Anchor Brewing's Sa... 1 Vote Up! How to Celebrate Cinco de Mayo This Year With Patr... 1 Vote Up! FRENCH QUARTER 1 Vote Up! Bacardi Lime CocoLoco 2 Votes Up! What to Know About The Boozy Sparkling Beverage Kn... 1 Vote Up! What to Know About Cavit's New Sweet Red Wine 1 Vote Up! A Sunset Sangria is the PERFECT remedy for Tax Day 4 Votes Up! Snowy River Jalisco 1 Vote Up! Snowy Tequila Sunrise 3 Votes Up! Electric Blue Mermaid 8 Votes Up! Snowy Dark Manhattan 2 Votes Up! Spring 2019 Must-Try Cocktail Roundup 1 Vote Up! Celebrate the End of Tax Season with Hornitos Tequ... 1 Vote Up! How to get the badge? Read the FAQs. Share what's on your mind! Join the discussion. ©2019 Liquor.com. Please drink responsibly. All rights reserved. Username or email address not found. Try again. The password reset link has been sent to your email address.